During the Victorian era a respectable gentleman never left home without his umbrella tucked under his arm and a lady always carried a parasol in the summer months to protect herself from the sun. 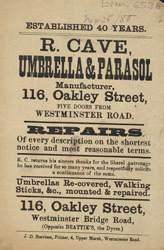 Originally umbrella ribs were made from whalebone, but soon cheaper cane ribs were. Metal frames were also available, but were very expensive and not particularly common.